17 years ago, Peter’s grandfather went missing under mysterious circumstances. Now, Peter and his friends have returned to the placid Wisconsin town to check out his inherited lake house and to partake in the annual ‘Muskie Madness’ fishing competition. Soon after his arrival, Peter begins to sense that something isn’t quite right, but none of his friends, nor the local sheriff, will believe him. 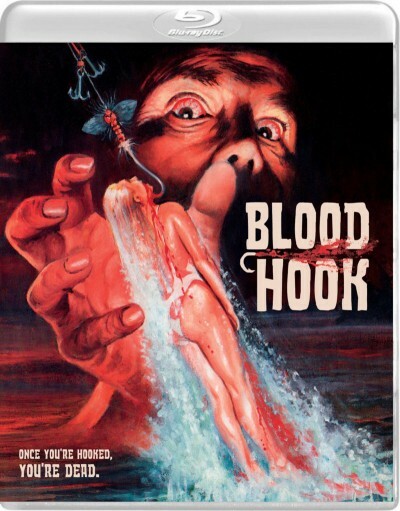 But as townsfolk and tourists begin to disappear, Peter becomes determined to solve the mystery, as well as that of his grandfather’s disappearance, and soon finds himself facing off against a fish hook wielding madman! 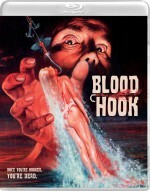 The feature film debut from director Jim Mallon (Mystery Science Theater 3000: The Movie), BLOOD HOOK is a distinctly comedic slasher that mixes copious bloodshed with wry satire. Never released domestically in its original version, Vinegar Syndrome presents this under-seen regional horror oddity fully uncut, and featuring previously censored gore and mayhem, on Blu-ray, in a fresh cinematographer-approved restoration from its original camera negative!